There was an excellent turnout for this year’s commemoration, with the first 75 attendees receiving a special Custom House commemorative badge. 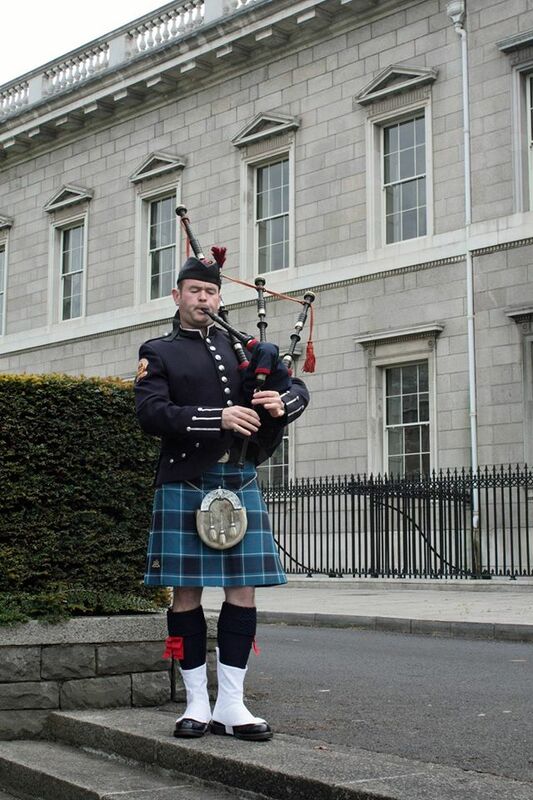 Piper Mark Toner, from the Dublin Fire Brigade, signalled the commencement of the ceremony as everybody gathered around the statue. In his brief address, Gary Deering thanked everyone for attending & all those who make the event possible – Liz & Micheal for organising the annual conference, Sean for making the Custom House available & all the staff in the Custom House who looked after us so well. 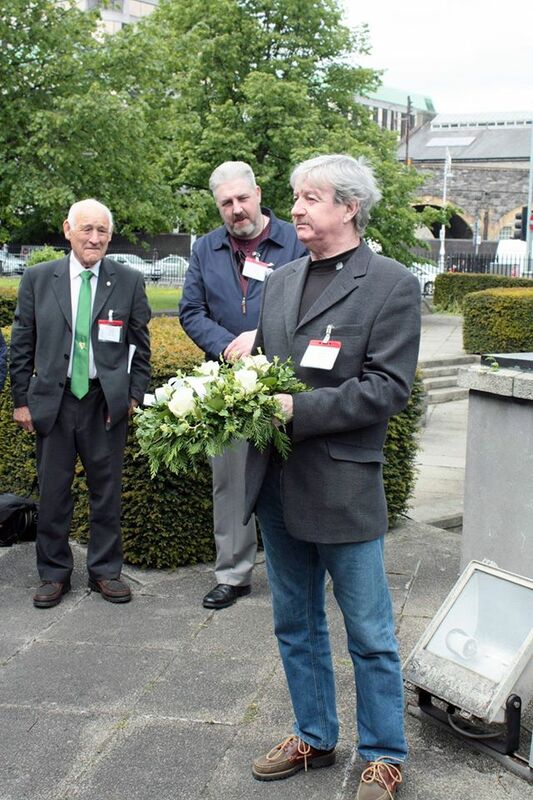 The first wreath ( in honour of the five IRA men who died & those who fought there) was laid by Thomas Kehoe. Thomas is the half brother of Tom Kehoe of the Squad, who fought and was captured at the Custom House & who later died in Co Cork during the Civil War. 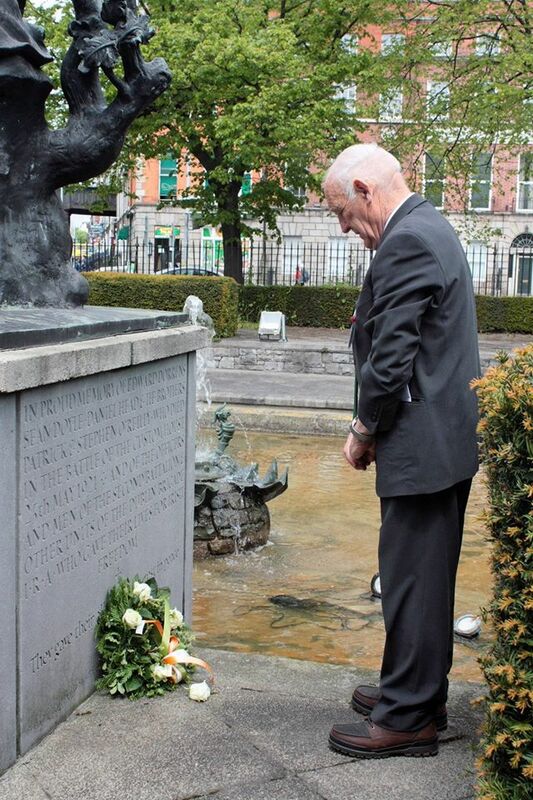 The second wreath – in memory of the four civilians who died – was laid by Colum Lawless. Colum is the cousin of Mahon Lawless who was one of the civilians who died on the 25th of May 1921. After the wreaths were laid, a special feature of this year’s event was the calling out of a Roll of Honour of all the men who mobilised & fought in 1916 and also took part in the Custom House operation. The first part of the Roll of Honour was read out by Nuala Ennis McDonald, daughter of Tom Ennis who led the raid inside the Custom House and was Commandant of the 2nd Battalion. The second part was read out by our own Gerry Cassidy, great nephew of Ned Breslin who fought and was captured at the Custom House & was subsequently to receive a bad beating from the Auxiliaries. 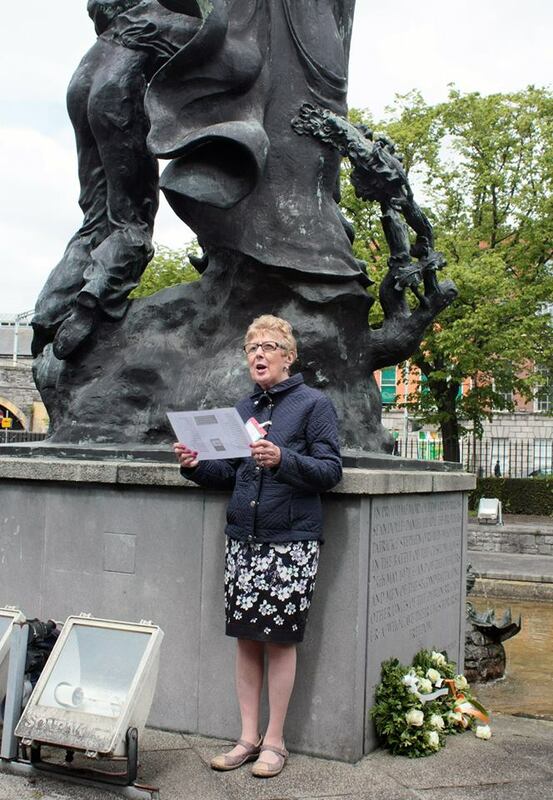 A minute’s silence was held in memory of all who fought & died in the Custom House operation & also for group member Liz Prendergast who sadly passed away since last year’s event. The commemoration then finished with a wonderful rendition by Mark Toner of “Lament for Limerick”. Following some excellent refreshments, kindly provided by the Custom House, the annual conference then commenced with some excellent & very informative presentations by Liz Gillis, Sean Hogan, Sgt Paul Maher, Paul O Brien, Des White, Las Fallon & Micheal O Doibhilin. The whole event was a great success with plenty of new faces & a lot of the older faces that have attended the event over the last five years. We look forward to many more of the same in the coming years.